With the research apps, interrelations between functional terms and graphs can be analyzed independently. The research app for linear functions, interrelations between term and graph of a linear function can be analyzed independently. In the left half of the two-part app the location of the starting line (dashed) is displayed and changed simultaneously to observe the effects on the parameters of the linear equation in the right half of the app. Conversely, in the right half of the app change the parameters of the linear equation and simultaneously observe the effects on the position of the straight line in the left half of the app. 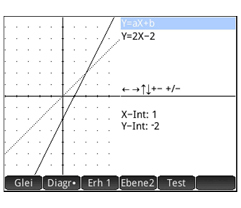 In both cases, the interfaces are in each case in the lower half of the application may be displayed with the x and y axis. The research app for quadratic functions, interrelations between term and graph of a quadratic function can be analyzed independently. In the left half of the two-part app can be the appearance and change location of the standard parabola (dashed) and simultaneously observe the effects on the parameters of the parabolic equation in the right half of the app. Conversely, in the right half of the app change the parameters of the parabolic equation and simultaneously observe the effects on the function graph in the left half of the app. In both cases the deformed parabolic equation, the value of the discriminant and possibly the zero point (s) of the corresponding function are displayed in the lower half of the app. 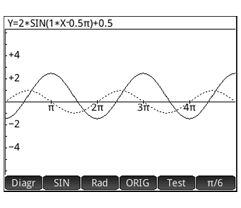 The research app for trigonometric functions, can be used to analyze independantly the interrelations between term and graph of a sine or cosine function. 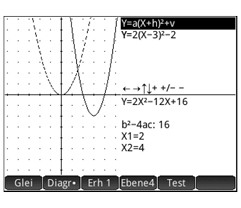 In the middle of the app you can view the appearance and the position of the output graph (dashed) and change simultaneously to observe the effects on the parameters of the functional equation in the upper part of the app. In the meantime, in the upper part of the app you can change the parameters of the functional equation and simultaneously observe the effects on the function graph in the middle of the app.